View More In Cake Rings. Why choose the Funwhale Cake Mousse Rings ? Reusable, very durable and easy to clean! 3 Size: S:4" * 4" * 1.77", M: 6" * 6" * 1.77", L:7.87" * 7.87" * 1.77".You can baked goods with your friends or family. What are you waiting for?? When you click in the ADD TO CART button at the top right of this page you'll get the best Cake Mousse Rings you'll EVER OWN! 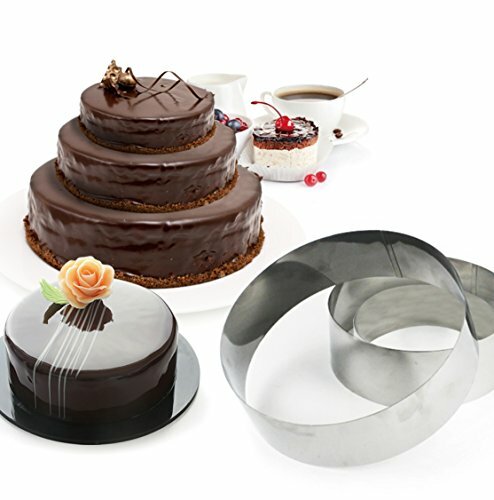 Pro-style food & dessert presentation: ideal for creating round appetizers, molded salads, cakes, mousse and desserts. Excellent for baking, layering, and molding of Cheeze Cake or Fruit Tart. Easy for cleaning, oven and dishwasher safe. Can also use the rings for cake cutters. Size: S:4" * 4" * 1.77", M: 6" * 6" * 1.77", L:7.87" * 7.87" * 1.77". If you have any questions about this product by FunWhale, contact us by completing and submitting the form below. If you are looking for a specif part number, please include it with your message. Cake Ring Stainless Steel, 3" High - 14"